Every dining experience tends to be made up of dozens of small choices that can dramatically change your enjoyment of a meal. Smoking or non? Eat-in or take-out? Lo-calorie salad or deep fried cheese? It may just be that I am a freak about food, but I for one agonize over every little detail of a meal and I know that I am not alone in this. But while people are capable of taking 10 minutes to decide on a salad dressing or what to bring for a potluck, when faced with the meal-breaking question of what wine to drink, they almost always go straight to the obvious choices, red or white? Whether guests in your home, or guests in your restaurant, this is the question that is usually asked, and almost always answered with any of the billion varieties of red or white still wines that are out there, as if these were the only catagories that we had to chose from. The other night, while moonlighting as a waitress in a friend’s restaurant, I was stunned and delighted when two sophisticated women accompanied their meal with a bottle of Cava, the delicious category of Spanish sparkling wines [sparkling wines->http://en.wikipedia.org/wiki/Sparkling_wine]. While it is not uncommon in France and Catalonia (the heart of Cava country) to accompany food with sparkling wine, it is still not a very common practice in the rest of Spain. In my experience, people here tend to order the occasional bottle of sparkling wine before a meal, but even more frequently at the end of one, to toast special occasions or to just look cool in front of their friends. Watching these women make their way through a bottle of Cava while they enjoyed their supper, reminded me of the world of wine choices that are out there, apart from the everyday choice between white and red. While even my 13 year old cousin knows that as a VERY general rule white wines go well with MOST fish, and red wines go well with MOST meats, I bet she doesn’t know what foods go well with sparkling wines (other than birthday cake), and more specifically what traditional Spanish foods marry well with Cava? In order to answer this question, it should be pointed out that just as all Champagnes are not the same, nor are all Cavas. The complexity, flavor, quality, and very characteristics of individual Cavas, depend on the wine or blend of wines used in their creation. These may include vintage wines from different years and/or non-vintage wines. These things also have to do with the licor de expedición that is added to the Cava after its second fermentation and aging process, and just before the bottles are corked and ready to go. Cava making process This licor is usually made up of a combination of reserve wine and sugar, and can also include brandies, aged wines, distilled liquors, etc. with each winery using its own secret and well-guarded formula. The amount of sugar that this mixture contains determines if the Cava will be Brut Nature, Extra, Brut, Semi-sec, etc. It is because of this sugar content that, for starters, when drinking Cava with a meal, it is usually advisable to stick to drier Cavas such as Brut Nature, Extra Brut or Brut, and leave the Extra Seco, Seco or Semi-Seco Cavas for another time. Looking for advice on maridaje (the Spanish term for marrying wines with food), I spoke with a Spanish sommelier who has years of experience working in traditional Spanish restaurants. He recommendend drinking Cava with the following (types of) traditional dishes, although I should note that these should be used as more of a rough guide as I assume that most of us do not prepare this traditional Spanish fare faithfully at home each night. According to him, serving either Extra, Nature, or Brut Cava is always a good idea with Mariscos (shellfish) and other fish dishes that may contain or combine strong flavors which might make chosing a white wine difficult. Examples of these dishes might include the traditional ajo blanco con pescado ahumado (cold garlic, almond soup with smoked fish) or faba verdina con centollo (green faba beans with spider crab). Simplifying things a bit, they also informed me that Cava is a fabulous accompaniment for two of Spain’s most beloved foods, Jamón Ibérico and Anchoas (anchovies) served in any form. For both of these very salty dishes, the acididy of a Brut Nature Cava for example, neutralizes the saltiness. Another good use for Cava was demonstrated in the case of the two women dining in my friend’s restaurant. While not all Cavas serve the same purpose, their bottle of Brut provided them with a liquid bridge between the varied dishes that they had ordered, which included roasted rabbit and tuna carpaccio. To get a broad idea of the wide variety of Cavas that are out there, I decided to taste five Cavas, all different in some way. Four of them were white, and one was rosado; four were from Catalonia and one was from La Mancha, three were Brut Nature and two were Brut, and all of them had varying levels of aging. Brushing up on my Cava tasting skills with the sommelier, I learned that the two things that you initially look at when tasting a Cava are the rosario (the bubbles as they make their way towards the surface) and the corona (the crown that the bubbles make around the rim of the glass.) The general rule of thumb is that the smaller the bubbles, the finer the wine. I was also told that the coronas should be constant and that when tasting sparkling wines you should not swirl them in the glass. Swirling the liquid causes the delicate carbon dioxide gasses to be released, and therefore dispersed more quickly. On an interesting side note, I also learned that a correctly opened bottle of Cava should NOT make that alarming popping sound that we associate with it, but rather should not make any sound at all. Armed with these tools, I set out to taste some “bubbly”. This Cava is made with 100% Macabeo grapes and left on its lees for 30 months. Vibrant golden yellow in color with fine bubbles, the wine has complex medium intensity aromas which include ripe almost dried apple, caramels and honeys, citrus fruits as well as notes of yeast and balsamics, leading to the conclusion that the base wine used for this Cava was aged to some extent. On the palate, it is pleasant, creamy and balanced with an agreeable bitter and slightly astringent backdrop. 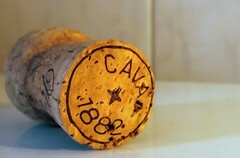 In general, a full-bodied Cava with a mega-ripe fruit presence, very interesting. Not as vibrant as a typical rosado, this Cava is the exact color of onion skin with cute little bubbles and a good corona. Persistent bakery aromas from the yeasts, along with strong notes of roses and citric fruits. On the palate it is fresh but almost biting suggesting that the carbon dioxide is not as integrated as it could be. Good acidity but maybe lacking a bit of fruit. Clean and sparkling pale lemon in color with slightly larger bubbles. Very fresh aromas of citrus and green apple, with slight dairy and herbal hints. Very acidic on the palate with bitingly persistent bubbles that made it impossible to taste anything else. Pale yellow and brilliant with super-fine bubbles and a delicate and constant corona. This extremely elegant Cava smelled exactly like a delicate and delicious apple pie with all the trimmings. Fruit, Cinnamon, Nutmeg, a flakey crust and even a touch of anis. Better than Christmas really. On the palate it was pleasantly sparkly, rounded, creamy and velvety with an apple pie finish. Also pale yellow and brilliant but with slightly larger bubbles, this Cava has aromas of crianza that include very ripe apples, lavender, anis, balsamics, pine and almost a cologne-like smell. The bubbles melt in your mouth and reveal an almost sweet and sour taste that doesn’t seem very well integrated into the wine.